Now the dust has settled on IFSEC International 2013 we can reflect on a very positive experience for Cortech Developments as an integral part of this international exhibition. 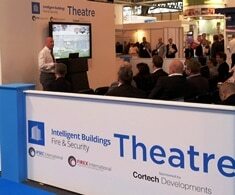 At the start of the year the company committed to sponsoring the Intelligent Buildings Theatre at IFSEC International as it aligned perfectly with Cortech’s proposition of delivering holistic software solutions for smarter building performance. The Intelligent Buildings Theatre [part of the IFSEC Academy] attracted consultants, integrators, manufacturers and end users in large numbers. They listened to a host of speakers representing a hugely impressive line-up of organisations from both the UK and overseas.